In this episode, a look at Microsoft's Game Room, a promising new distribution channel for retro videogames. The Gaming After 40 video podcast is also available via iTunes. And be sure to visit our Facebook page! 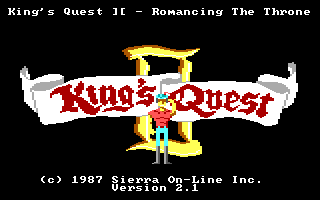 This week, we're tackling the third in Roberta Williams' classic 3-D animated adventure series -- King's Quest III: To Heir Is Human, released by Sierra On-Line in 1986. The first act of the game requires careful time management, as Manannan keeps a close eye on Gwydion and only leaves him alone for twenty-five-minute periods of travel or sleep. Gwydion can't carry any unusual items or leave any evidence of his exploration where the wizard might notice it, which creates a terrific amount of tension as the minutes tick away. Time is also of the essence on a larger scale, as Gwydion only has foodstuffs sufficient to feed the wizard three or four times, and if mealtime demands cannot be met, it's curtains for our hero. Gwydion's chores are also always on the agenda -- sometimes Manannan orders specific actions, like emptying the chamber pot. At other times, a player action like TAKE BROOM leads to an extended sweeping animation, the same as SWEEP FLOOR, during which we can't do anything else -- the game informs us that You're too busy sweeping if we try. The chores are useful for looking busy while Manannan's around, and for killing time while waiting for him to go away. As was often the case with Sierra's early games, the graphics and text are sometimes out of synch -- the oaken bucket in the kitchen looks more like a metal pail, for instance. The parser doesn't recognize a lot of interesting props, and the generic responses cause some unusual behavior; I tried to aim the wizard's telescope, yielding What's a north?. SEARCH [object] returns Is it lost? for unsearchable items, and the command interface handles some prepositions but seems to be a two-word parser at heart -- HIDE IN FIREPLACE acts just like HIDE FIREPLACE, though LOOK THROUGH TELESCOPE is recognized as distinct from LOOK TELESCOPE. Learning the wizard's journey, sleep, and dining schedule is important, as is exploring the house and concealing any interesting items under Gwydion's bed so the wizard will not suspect his houseboy is plotting an escape. Of course, "interesting items" are defined at the designer's discretion, leading to some contrived situations, as when Gwydion picks up a dead fly, and we are told that he is disgusted at carrying the deceased insect, so he just pulls off and keeps the wings. 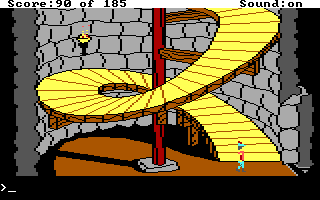 Perhaps his enslavement is driving him toward Renfield territory, but he seems to be all better by King's Quest VI. Randomly appearing hazards continue as well -- there are a couple of unsavory bandits, the wizard's nasty cat who likes to trip Gwydion on treacherous staircases, and a Medusa who can turn him to stone. But some of the situations are handled more gently this time around -- when we encounter the classical Three Bears, if we trample on Mama Bear's flowers or knock on the door while Papa Bear is home, we are rebuffed with a swift paw swipe, but the attack is not fatal. Of course, there's also a giant spiderweb that can't be examined, the parser tells us, because You need to be closer -- but once we're close enough to get a good look at it, Gwydion becomes trapped in the web, and a massive spider descends and swallows him whole. 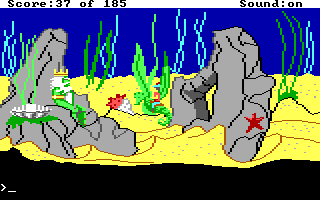 As in earlier King's Quests, Gwydion can drown if he swims too far out into the ocean; unlike the earlier games, there's no real reason for him to swim around in this one. Most of the random items found in the game prove useful as ingredients for various magical spells, with telltale references like interesting cactus denoting the only one Gwydion can actually pick up. I didn't realize that the spells were only printed in the game manual at first, and I spent a lot of time trying to read the wizard's spell book in-game without finding any useful details. I also mucked about in the kitchen trying to use the lard and fish oil and mixing bowl to come up with some way to take the wizard's cat out of commission, which also proved unproductive, as I couldn't PUT anything in the BOWL. The AGI engine shows its age in a couple of ways -- non-player characters aren't able to enter a room of their own accord, or maneuver on anything but a random path, which leads to unusual situations like Manannan appearing in the dining room to tell us he's ready to eat, if that's where we happen to be, then disappearing. He won't actually show up in the dining room until we exit and return to find him seated at the table. And while the clock ticks away in real time, even while we're entering commands, it freezes whenever a text popup is displayed; this is particulary noticeable when we STUDY BOOK in the wizard's lab and are able to page through quite a bit of material in zero time. King's Quest III continues Ms. Williams' fondness for "keep re-entering the room until the character you want to avoid isn't randomly there" pseudo-puzzles -- I don't mind the randomness of it so much as the fact that we don't see these characters arrive or leave, or if we do the world isn't handled consistently. Here, we can witness the three bears returning home, but the house may still be empty if we step out and return; once inside, we need to get a bowl of porridge (that's just right, of course) and a thimble. My text-adventure habits tripped me up dealing with Medusa in the desert - I kept trying to HOLD MIRROR and enter the room, but the mirror failed to deflect her petrifying stare. It wasn't until I used the magic map to teleport into the room that I realized what I was doing wrong -- it's a matter of facing AWAY from her as she approaches, then doing a HOLD MIRROR when she's in range. It hadn't occurred to me that it was vital to keep Gwydion facing away from her, though it makes perfect sense in a visual context. I was able to get through much of the game without a hint, but I needed help to find the key to Manannan's locked cabinet -- as it turned out, I had not looked on top of the closet in the master bedroom. 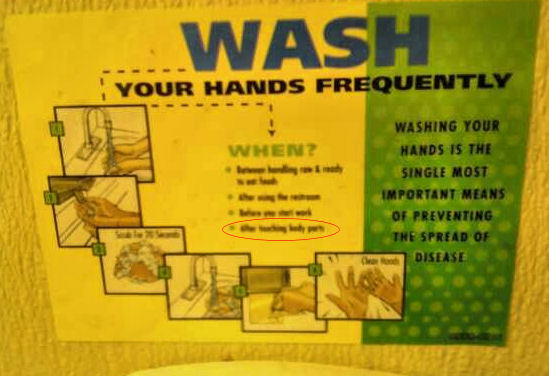 I had assumed the solution would be less mundane, somehow. The process of mixing the spells is quite exacting -- even one wrong step is fatal -- and the instructions in the manual aren't always accurate or easy to follow. I had particular trouble with the invisibility potion -- while I did not need to actually track down a spoon for other recipes that required stirring with a spoon, this one required Gwydion to have the wooden spoon from the kitchen, and the knife. Thus prepared, I still had problems following the manual's instruction to measure a spoon of cactus juice -- MEASURE SPOON OF CACTUS JUICE only yielded What's a measure? I persisted, trying and failing to USE SPOON, DIP SPOON IN JUICE, USE SPOON TO PUT JUICE IN BOWL, PUT CACTUS JUICE IN SPOON -- and finally consulted a walkthrough, to learn that I had to SQUEEZE CACTUS JUICE INTO SPOON. Furthermore, if we PUT CACTUS JUICE IN BOWL without measuring it as the game expects, we are told You carefully add the spoonful of cactus juice to the bowl... after which the spell fails in a fatal and confusing manner. The AGI graphics are a bit of an issue in finding some of the spell ingredients -- the pixels on the ground beneath a tree are acorns, it turns out; I had thought they were walnuts as in KQ1, and so failed to pick them up when I first tried, leading me to conclude they were just decorations. In trying to get some hair from the cat for another spell, I mixed the sleep powder and attempted to use it on the animal. But the game doesn't recognize the basement as a "dank, dark place" per the invocation requirements. I finally discovered that (with persistence) Gwydion can just TAKE CAT, then TAKE HAIR. I also discovered that the eagle feather does not work as a "small feather" -- and after looking around in the woods on the screens with resident birds, and finding nothing of use, I finally remembered the chickens in Manannan's yard. It seems odd that there's not a single stray feather in the coop or on the ground, but it's relatively easy to catch a chicken and pluck a single feather. Using the spell that allows Gwydion to listen to (though not communicate with) animals, we can also discover that he is actually Prince Alexander, heir to the throne of King Graham of Daventry. While the game's subtitle (and that of sequel King's Quest IV, with the benefit of hindsight) make this no big surprise, it still seems odd that Manannan's chickens know this information while Gwydion/Alexander himself does not. Those are some pretty clued-in domestic fowl! Once Manannan is out of the way and Gwydion is free to come and go as he pleases, the story shifts gears to preventing Rosella's imminent demise. Gwydion can pay to book passage on a ship to Daventry, but of course it turns out the crew are pirates who steal his possessions and throw him in the cargo hold. It's not too difficult to regain the lost inventory, as long as we save game before entering each new room to avoid random pirates, but escaping the ship takes some patience. Casting the storm spell on the boat proves fatal, and the lifeboat below decks isn't helpful. 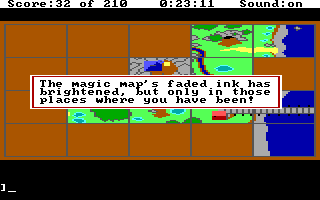 The magic map refreshes once we're onboard the ship, but it's not safe to teleport into the ocean either. We actually have to wait for the ship to reach its destination and drop anchor, then invoke the sleep spell in the dark, dank hold to put the ship's crew under. Flying like an eagle works to escape the ship, and to make it most of the way over the treacherous mountain ahead. That's not to say it isn't dangerous. Casually walking in on the dragon means instant death, though we get a hint before dying as the game tells us It has SEEN you! Going invisible allows us to reach Rosella, but attempting to untie her before dealing with the dragon invokes its fiery wrath, burning brother and sister both to a crisp. Conjuring a storm to fry the dragon with lightning makes short work of the scaly beastie, and Rosella is rescued. The game's not quite over yet, but the story starts to break down a bit here -- Gwydion unties Rosella and says, "Let's go meet the folks!" Which raises a serious question -- how is it that our old friends King Graham and Queen Valanice don't know where their children are, and haven't gone looking for Prince Alexander for nearly seventeen years, leaving him to suffer a stunted and deprived childhood, when various royal and magical resources might have been brought to bear toward his safe return home? And how is they've allowed Rosella to be the local dragon's next victim, without so much as a quest to try to prevent it? Maybe Ms. Williams is subtly telling us that power corrupts, or makes lazy, anyway. Rosella becomes a bit of a gameplay burden at this point -- she follows Gwydion/Alexander so closely that he's prone to fatal falls on the stairs while trying to lead her home; neither the map nor the random transportation spell are of any use at this point, so mastering the diagonal keys or plugging in a joystick becomes necessary. Once we're on safe ground, a kindly gnome helps the siblings get back to the castle -- strangely, his musical theme seems to be lifted from the Saturday morning Smurfs cartoon. Oh, the suspense! 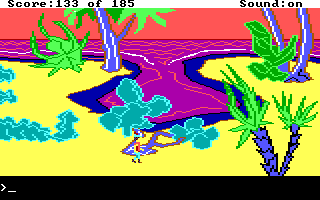 Of course, history informs us that the next game in the series will be King's Quest IV: The Perils of Rosella, so we can predict how this will turn out. 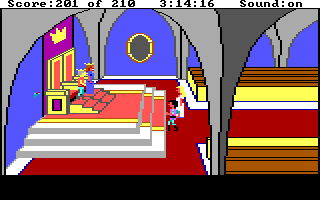 I enjoyed King's Quest III quite a bit -- it represents a big step forward for Roberta Williams' design approach, with a palpable sense of tension and solid plot development in the early going. The later sections feel much more traditional, with lots of navigational challenges, enemies to physically avoid, and save/restore guessing at which spells to try. But a good beginning goes a long way in an adventure game, and the emotional connections established while helping Gwydion escape from servitude help keep the story engaging to the end. The LoadDown - 03/29/2010 - XBLA Game Room! It's Monday, and time to take a look at recent downloadable games for the various console platforms. The big news this week is the arrival of a new distribution channel for retro games, in the form of Microsoft's Game Room. WiiWare -- Two new titles this week. WarioWare D.I.Y. Showcase allows Wii owners to download and play frantic microgames created on the DS WarioWare D.I.Y. platform. Diner Dash brings the popular PC title to the Wii. Wii Virtual Console -- A rarity this week -- Ogre Battle 64: Person of Lordly Calibre brings the classic Nintendo 64 strategy game to the VC. 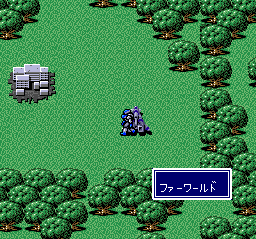 I really enjoyed the SNES Ogre Battle, so this one is tempting. DSiWare -- Five new titles this week, three of which are traditional games. Disney Fireworks is a virtual toy with game elements, allowing the player to generate colorful fireworks displays with the stylus and hit targets for points. Save the Turtles is an action-puzzler challenging players to help baby turtles hatch and make their way to the sea. Two musician tools, Nintendo DSi Metronome and Nintendo DSi Instrument Tuner make the DSi a useful companion for practice and performance. Super Yum Yum Puzzle Adventures stars Leon the chameleon. XBox Live Arcade -- No new games for the general XBLA platform last week, because the new Game Room channel became available (on XBLA and also for Windows PC). As weekly retro game releases are expected, I will be covering this as a unique distribution channel, with a review coming up on this week's video podcast. XBLA Game Room -- Debuted on February 24th, 2010, with a solid mix of thirty-one games for a number of platforms. 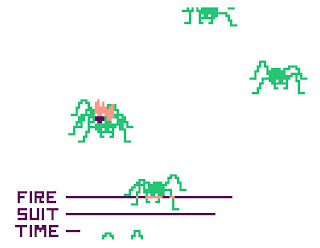 Specifically, for the Atari 2600: Adventure, Combat, Millipede, Outlaw, Realsports Tennis, Star Raiders and Yar’s Revenge. For the Intellivision: Armor Battle, Astrosmash, Football, Sea Battle, Mountain Madness - Super Pro Skiing, Space Armada, Space Hawk, and Sub Hunt. Atari coin-op arcade games: Asteroids Deluxe, Centipede, Crystal Castles, Gravitar, Lunar Lander, Red Baron, and Tempest. Konami arcade games: Battlantis, Finalizer, Jungler, Road Fighter, Scramble, Shao-lin's Road, Super Cobra and Tutankham. So far I've purchased Tutankham for unlimited play. So far. PS3 on PSN -- Three new titles arrived last week after a quiet period. Blue Toad Murder Files is an episodic series of mystery/puzzle games. Hamsterball is an action game patterned after the classic Marble Madness. Wakeboarding HD is a retro-style water-based stunts-and-hazards game. 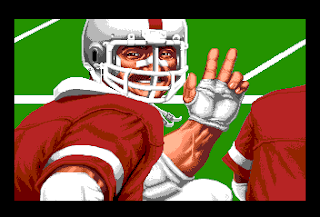 I always thought that the spandex video game glove was an early-80's affectation, surviving only during those heady, pioneering days when the term "video athletics" could be uttered with a straight face. These manufacturers never really got it. Few serious gamers would consider the hot look (in neon pink, orange, green or yellow) a realistic prerequisite for being one of the best players around. Especially as the arcade scene was already ceding dominance to home consoles, and the only person likely to see you in your hot gloves was your snarky little sister. Still, the ad does its best to make the prospect seem attractive, citing the gloves' appearance on the mysterious Video Power TV show and shouting It's HOT! It's NEW! in colorful starbursts. 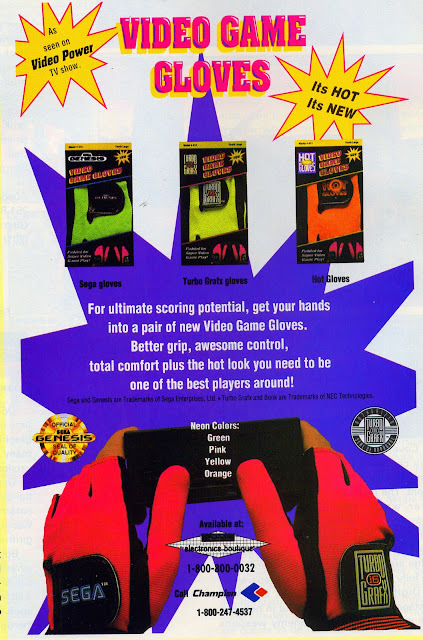 I have no doubt the gloves were hot -- they are described as Padded for Super Video Game Play, which likely made them feel like sweaty neon oven mitts after fifteen minutes or so. But calling them NEW is radically overstating the case. The Colecovision videogame console was a pretty capable piece of hardware in its day, but its standard controller was... shall we say... unwieldy. It featured a stubby joystick that made it hard to register the intended direction, side-mounted fire buttons that wore out one's squeezing muscles fairly quickly, and a keypad that took up most of the unit's surface area. So it was only a matter of time before aftermarket controllers arrived to address the situation. 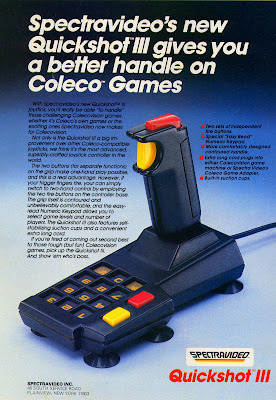 Note the suction cups -- the ad claims the Quickshot III can be used two-handed, but clearly this is meant to be a surface-mounted controller, throwing in the towel as far as handheld comfort goes. 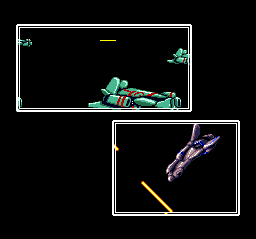 Note also that the design requires the player to reach around the joystick to hit any of the keypad buttons -- which are, of course, obscured by the player's joystick-gripping hand during play. At least the ad only mentions use of the keypad to select difficulty level and number of players, implicitly acknowledging its complete unsuitability for any game that requires keypad access during play. It's also worth noting that the ad mentions that this controller will work with Spectravideo's Coleco Game Adapter, intended to allow Colecovision cartridges to run on the company's MSX-based home computer. The Spectravideo computer was released but failed to make a noticeable dent in the US market, and as far as I can determine its Colecovision adapter never actually came out. Quick shot, perhaps. A miss, for sure. 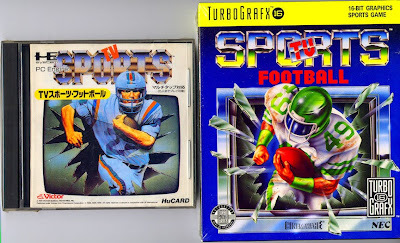 What I hadn't known until a few years ago was that TV Sports Football also made its way across the ocean to Japan for the PC Engine, courtesy of Victor Musical Industries. Normally this would be perfect material for an interesting East vs. West comparison, but in this case the Japanese localization had very, very little impact on the game as a whole. And that's about all there is to it. 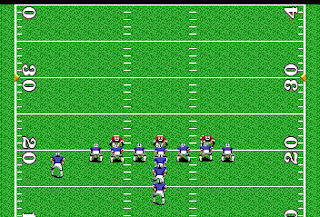 I can't imagine this game was a big seller in the US, let alone in Japan; the presentation is nicely done, but it's an entirely generic title and could not have provided much competition for EA's early Madden Football games on the Sega Genesis. Watching the Buzzards take on the Hounds was never the same as watching the Steelers vs. the Packers, or even the Lions. If you simply must have every release of TV Sports Football ever produced, you may be able to find it at this affiliate link. It's not an expensive game in any territory - nothing, it seems, is less collectible than an aging sports game. Younger readers may not be aware of just how big the Cabbage Patch Kids were in the early 1980's -- new manufacturing techniques allowed each chubby little doll's coloration, outfit and features to be randomized and fairly unique, but shipped quantities were insufficient to meet early demand, and stories about physical altercations between shoppers in search of the elusive dolls were common at the time. 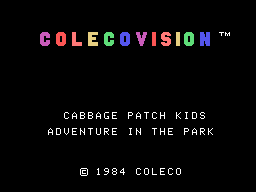 Coleco survived the death of the Colecovision during the mid-80's industry crash largely on the back of the Cabbage Patch Kids, but that craze also came to an end -- a more definitive one, in retrospect -- and Coleco went under shortly thereafter. This was a fairly late entry in the Colecovision library, and it's a smooth, colorful game with simple but pleasant background music. 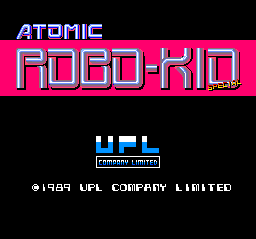 A notable visual improvement is the adoption of arcade-style screen fonts, which Coleco often featured in its early artists' renderings of upcoming games, only to rely on the console's standard thin-line font (as seen on the title screen) in the actual releases. 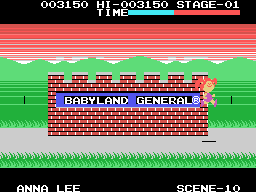 Cabbage Patch Kids: Adventures in the Park is an entertaining little platformer, and the Colecovision technology was within a stone's throw of the NES in many ways; playing this game, it's easy to see Super Mario Brothers as a logical next step, just a few years later. This week, we take a look back at the Nintendo-est Saturday morning show ever -- Captain N, The Game Master! One of the best things about writing this blog series has been the discovery of lost gems -- adventures I would have loved back in the day but somehow missed out on completely. A reader recently made me aware of Robert Arnstein's Xenos, published by Radio Shack for the TRS-80 Model I disk system. I played and enjoyed Arnstein's Pyramid 2000, Raaka-Tu, and Bedlam when they were released, but I never owned a disk drive for the Model I and had moved on to the Color Computer by the time this game arrived. Arnstein's earlier games were written to load and run completely in-memory, and it's interesting to see how the availability of disk storage for this title affected his design approach. The map is huge and tricky to navigate outside of town; descriptions are much more detailed, and there are numerous red herrings and interesting areas to explore that enrich the story and atmosphere but aren't essential to completing the game. There are also dead ends and surprise fatalities, in the old-school adventure tradition. For specifics, read on... and I always say this, but it bears repeating: those who wish to experience Xenos for themselves are advised to do so before continuing here. I'm pleased to document the interesting details of these games for the record, but my comments aren't meant as a substitute for the actual experience. From a technical perspective, Arnstein did not adopt the Infocom approach of cacheing text into memory as needed -- instead, Xenos keeps all the critical variables in memory, but uses overlays to replace whole sections of the game map and text at once. The effect is generally seamless, aside from the obvious loading times. The only drawback is that the game is smart enough to use brief descriptions for rooms we have already visited -- but once we cross the overlay boundary, the verbose text returns as though we are entering for the first time. The game is nicely designed from a progression perspective -- one initially gets the impression that the highways and deserts outside of town are infinite, but they actually are mappable, and they don't loop back on themselves for quite a distance. But it's best to ignore the outside world and focus on the town at the beginning, in order to collect items that will be needed later. Mr. Arnstein clearly enjoyed the freedom to write lengthy descriptions, but he goes to naturalistic extremes in town -- in every location, we can see what's nearby, as well as what's down the street a few "rooms" away. It's useful detail during initial orientation, but as we discover that every room describes our perspective in extensive detail, it starts to seem unnecessary. And it becomes annoying later on that such detailed information is NOT provided in the desert areas that are so tricky to map -- a few landmarks visible in the distance would make it easier to keep our bearings, without damaging the game's naturalistic style. There are some intriguing artifacts and locations that don't ultimately lead anywhere, and seem like design leftovers from story elements ultimately cut for space. At the beginning, the Last Chance gas station presents us with a jack, a skeleton key, a padlocked gas pump, and a crowbar. The jack can be used to replace the flat tire on a jeep parked in back of the gas station -- we can even GET IN JEEP and attempt to START JEEP, learning that the battery is dead -- and the skeleton key can be used to access the gas station's restroom. But there's no ultimate reason to do any of these things. There's also a mysterious alcove in town, which the game pointedly tells us is NOT VISIBLE FROM THE STREET OR THE DESERT; but we can neither enter nor examine it. A radiation detector occasionally flashes in its vicinity, but nothing ever comes of it. I like the way the story is developed in general -- there are some subtle details that work well. The radio in Harvey's Bar & Grill briefly mentions a strange UFO landing, then goes back to playing music. We run across a key for Slim's grocery store, but it's already been broken into and ransacked when we arrive. The puzzles in town aren't particularly difficult -- it's mostly a matter of doing things in the right order -- but the sense of hasty abandonment is evident everywhere we go. Dealing with the dangerous snake lurking in the north end of Bob's Hardware store feels a lot like the RPG-esque monster battles in Arnstein's Raaka-Tu at first blush. I made several attempts to bludgeon the snake to death with a nearby shovel, and was able to do so -- but never without being fatally bitten in the process. Failing to find any sort of armor, and not wanting to waste the dynamite, I finally liberated the shotgun from the sheriff's office and found it to be a safer, more efficient solution. 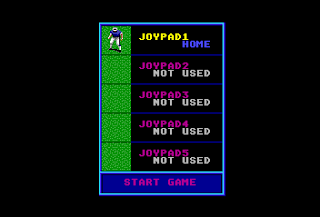 The SAVE GAME feature requires a formatted disk in another drive, and only allows one save per disk, making it difficult to keep and go back to a "good save." 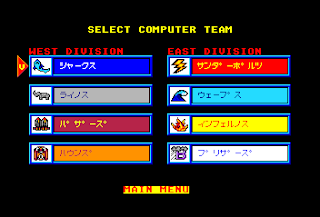 For efficiency's sake, I tried mounting two save disks in (virtual) disk drives 2 and 3, but even when I specified disk 3 as the target, the game always wrote to the first disk it found, in drive 2. I thought the number 33 might be a clue of some kind -- gas is priced at $0.33 a gallon, the bank has $33,000 in assets -- but I never found a connection. The puzzles in town are generally realistic, with some useful clues about what we should do next -- there's no magic or alien technology involved in the early going. A sign in the hotel informs us there's a storm shelter on the west side of the saloon; we can dig our way into it to find the stick of dynamite. But the game's not intrusively guided -- on my first attempt, I used the dynamite to liberate the bank's assets from the vault, which worked just fine, but made it impossible to finish the game when I later encountered an immovable boulder. There's nothing truly useful in the bank's vault, just money which has no purpose within the scope of the game. A bottle in the bar purportedly contains whiskey, but is poisonous if we drink it. I'm not sure if that's meant to be a clue, a commentary on alcoholism, or just a nasty trick. I though it might be useful for sterilizing the wound from the snake's bite, but I found no way to apply it. The game doesn't have much of a sense of humor -- it's generally played straight and bleak, though there are glimmers of the author's voice here and there. If we don't have the shovel, we can try to clear the entrance to the bomb shelter manually, but DIG SAND WITH HANDS only yields I DIG IT TOO, MAN! One interesting RPG-style feature in Xenos is that there are some size/weight factors considered in the inventory handling -- we can carry many keys around, but only a few of the larger items. Most games of this era just put a limit on the number of items; the limit here is not overly restrictive, but it does require a bit of planning and risk-taking. Even though it was not a good idea and I had to backtrack, I was glad I experimented with the dynamite in the bank before needing it later on under duress. There are instructions printed on the stick of dynamite telling us to STRIKE FUSE and evacuate the area. I found that I could not THROW DYNAMITE AT BANK or THROW DYNAMITE INTO BANK. And I also learned that if I dropped the dynamite first, STRIKE FUSE would cause me to pick it up again. It takes a few turns for the dynamite to explode, so the correct usage is to STRIKE FUSE, DROP DYNAMITE, and skedaddle. 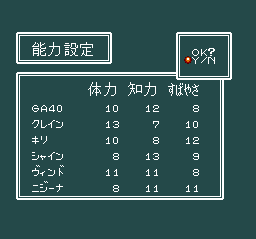 The game's scoring mechanism is simple, reporting the mission's overall percentage complete; there are ten milestones, each worth ten percent, and not all of them have to be achieved. The shotgun has two shells in it, and we can use it to kill the dangerous shaggy alien encountered in the desert. But another one always shows up shortly, so it's best to just keep moving if we can avoid being successfully attacked by these creatures. If we are hit, we find that we now have A POISON in our inventory -- but we can't DROP it or even EXAMINE it; we're just marked for death within a handful of turns. Mapping presents the most difficult challenge of Xenos. There are many, many rooms -- the desert does not simply loop or wrap around on itself, at least not consistently, and the alien ship has color-coded portals that seem to be part of a giant state machine -- doing the same thing in the same room does not necessarily take us to the same place it did before. I succeeded in finding some interesting elements in both environments, but only a few turned out to be important. The desert is particularly frustrating because we can only survive the exposure and the constant alien attacks for so long -- there are some trails and paths to follow, but they are not the shortest possible routes to the key areas. The story's second act starts to kick into gear when we discover a dying alien being in the desert, who says "GLEEPOOP!" in the time-honored Squa Tront! Spa Fon! tradition of making alien languages sound like gibberish, and points west before expiring. We acquire the green cube and the rod with the green sphere for later use when we find the alien ship. As it turns out, the green sphere mounted on the rod is a hazard detector. We are occasionally told that the GREEN SPHERE IS SLOWLY FLASHING AND BEEPING, but its only significant behavior occurs when we near the alien ship's engine room, at which point it begins beeping louder and finally flashing wildly. Of course, it's too late once we're inside the MOTOVATOM ENGINES room -- we shortly become nausesous and die of what I presume is radiation poisoning. Exploring the alien ship requires navigating a series of small rooms, pushing colored buttons to open portals to other locations. I had to break myself of an old habit borne of the Scott Adams adventures -- it's actually necessary to PUSH BLUE BUTTON, and I kept trying to abbreviate the command to PUSH BLUE. 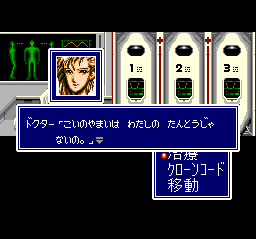 At last we reach the ARMSMITAN WEAPONRY room, which has a viewing screen, a white button, and a green button. All we have to do here is turn on the weapons system by pushing the white button, then POINT AT MOTHER SHIP to see the alien base destroyed in an instant by an energy beam. I enjoyed Xenos quite a lot in the early going, but the mapping started to become a pain after my umpteenth death in the desert. The puzzles are logical and not particularly difficult, but I was glad to have a walkthrough handy later on -- by the time I emerged from the alien craft, I had covered several sheets of paper with boxes, loops, and arrows crammed in as best I could, and was no closer to finding my way around efficiently. I was anxious to get back to town and see if I could fire up the jeep -- which proved unnecessary in the end. Xenos features some really good interactive storytelling, and is well worth playing -- but I prefer my mapping challenges in much smaller doses. The LoadDown - 03/22/2010 -- Cave Story! Perfect Dark! WiiWare -- One major title finally arrives this week on WiiWare -- Cave Story, the retro-style RPG/platformer available as freeware on many platforms, getting a bit of a visual upgrade for this commercial Wii release. It's a solid game, and it's very nice to see creator Pixel potentially earning some revenue for his stellar work. Wii Virtual Console -- Nothing new this week. DSiWare -- Five new titles debut this week. Drift Street International is a full-featured 3-D urban racing game which purportedly takes advantage of the DSi's extra horsepower. Libera Wing is a sci-fi tower defense game. And there are three Game & Watch remakes celebrating Nintendo's early handheld electronic games -- Mario's Cement Factory, Chef, and Judge; these are simple but polished games, perfect for killing a little time on the go. XBox Live Arcade -- An update of a classic title arrives -- it's Rare's Perfect Dark, which began life as a Nintendo 64 first-person-shooter. This release reportedly also includes weapons and a number of maps from Rare's GoldenEye 64 as well, stripped of the James Bond license that's kept the game in legal limbo for far too long. The textures have been up-rezzed, but the 3-D models are still very boxy -- it gives the game a bit of a strange look. But it plays well with the 360 controller. PS3 on PSN -- Nothing new for the PS3 last week, but Telltale Games announced that Sam & Max Season 3 will be debuting on PC and PS3, leaving the 360 and Wii to play catchup this time. All appropriate advice, no doubt. But a little unnerving to see posted near the butcher's counter. 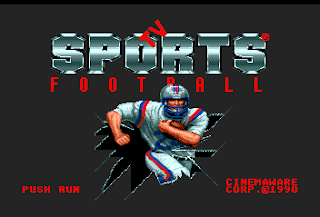 In the late 8-bit/early 16-bit era, Ocean was known primarily for publishing movie-based games. Usually these titles were generic platformer designs with artwork inspired by the movie license slapped on top. And usually these games were released just in time for the movie to hit the big screen, with ads prominently featuring the movie logo. For one such game, things were different. First, this game didn't make it to the Super Nintendo Entertainment System until 1994, seven years after the movie's theatrical release. See it? Wrapped around two of the three shiny, shiny bullets? Brian de Palma's The Untouchables? The logo is actually quite a bit easier to spot in this scan than in the original print ad -- I found myself staring at the page in Video Games & Computer Entertainment for a long, confused moment, wondering what the ad was promoting, before I spotted it. Remember, kids -- when you're advertising a game based on a license that's no longer current, the last thing you want to do is hide the name. 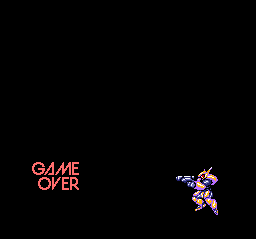 The difficulty has also been toned down -- I didn't have much problem making it through the first six stages, with the Act 3 boss battle over before I realized it was such. 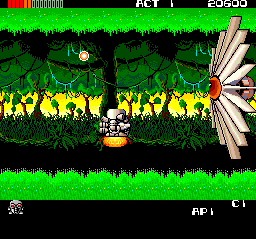 But the action is still pretty frenetic, and the design has a sort of super-deformed H.R. Giger look about it that manages to be cute and cybernetically creepy at the same time. The action does become repetitive after a while -- the difficulty ramps up, but the basic premise doesn't really change. 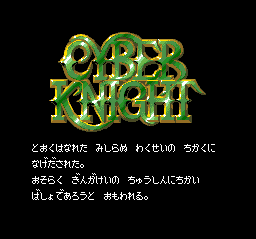 Like most arcade games of the late 80's, it was originally designed to extract another token from the player's pocket as often as possible; the continues are limited to three here, so the player does have to develop a bit of skill, but it's not nearly as challenging as the coin-op. 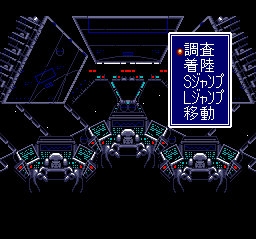 Everything's in English, and the graphics look lovely in stills, so this is yet another game NEC mysteriously chose not to pursue for release on the American TurboGrafx-16. 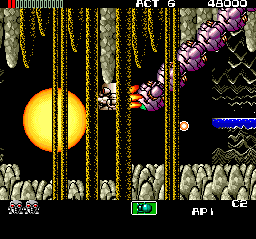 A Sega Genesis version did come out in the States, courtesy of small publisher Treco, but while the parallax scrolling was preserved, it didn't look, sound or play quite as nicely as it did on NEC's little white box. Ah, well. You can't win 'em all, Atomic Robo-Kid. Book-inspired games have never been common, and action-oriented adaptations even rarer. 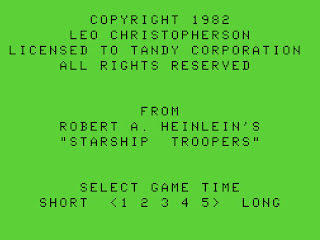 One such title was Leo Christopherson's Klendathu, published by Radio Shack for the TRS-80 Color Computer back in 1982, based on Robert Heinlein's classic sci-fi novel Starship Troopers. Christopherson established a reputation for impressive animation on the TRS-80 Model I, where his artwork and sound design brought personality and life to games like Android NIM and Dancing Demon. This was his only published game for the CoCo, and while he took advantage of the color capabilities and square(ish) pixels of the new platform, his work here isn't spectacular. The burning flames look quite nice, and the bugs' walking feet are properly anchored to the ground, but there just isn't much else to look at. The soundtrack is also weak compared to his Model I efforts -- it consists of simple pops and beeps, with nary a hint of a keening alien insect or crackling flame. 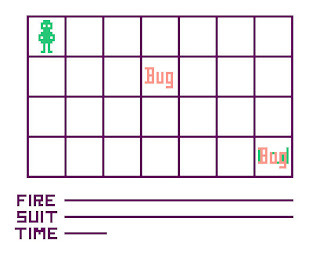 There isn't much more to the game than that -- fight the bugs, fight some other bugs, earn money, gain rank, and repeat. 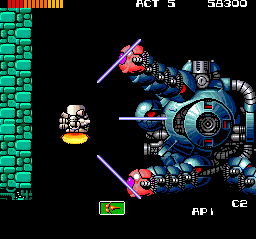 There are two difficulty levels and 5 game lengths to choose from, but the gameplay is essentially the same in all modes. Klendathu's design is simple and light on story detail, and the audiovisuals aren't nearly as atmospheric as one would like them to be, but the constant pressure to leap out of any given battle and see how the war is going overall provides a realistic touch. It was a unique CoCo-exclusive game, a fresh experience in its day, and I enjoyed playing it enough to seek out and read Heinlein's novel a few years later. In this episode, we play through three vintage text adventures in under eight minutes, taking advantage of a handy programming bug. The Gaming After 40 video podcast is also available on iTunes, blip.tv, and elsewhere. If you like the show, please tell your similarly inclined friends about us! 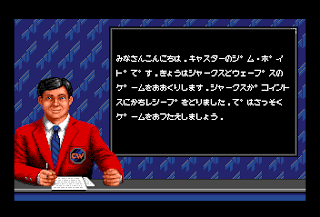 The game was created using Sierra's original Adventure Game Interpreter, which runs in half-resolution to save memory for the depth masking used to create the 3-D effect. 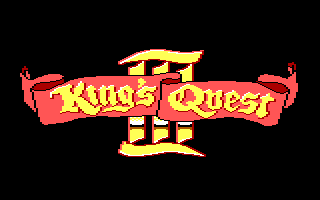 My first experience with KQ2 was with the 1985 version, on an IBM PC with CGA graphics, using dithering of the 4 available colors to approximate the intended look; the full 16 colors available in EGA look much, much nicer. As with other Sierra AGI games, the keyboard interface is still very important -- we type our commands, although the animation means that many of them cannot be executed unless Graham is standing in the right spot. But he is a lonely monarch; a vision of a beautiful woman trapped in a tower appears in the future-foretelling magic mirror hanging on the wall, and, in a simply rendered but dramatic moment, Graham dons his adventurer's cap once again to venture forth in search of love. 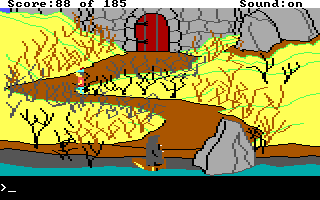 King's Quest II bears many striking similarities to King's Quest I. 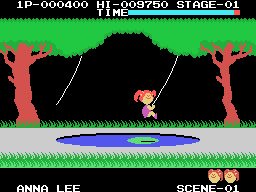 There are three sub-sections to complete in order to find keys to unlock three nested doors; the wraparound world map is sparsely-populated, dominated by trees, fields, mountains and beaches; and the random hazards and characters are almost exactly the same as in the first game. 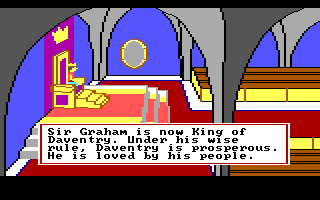 With King Graham at large looking exactly like Sir Graham, this adventure feels more like an alternate version of the first story than a true sequel. 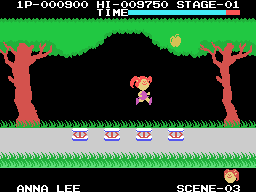 Roberta Williams uses fairy tale elements in many of her early games. This time, we find Grandma's cottage early on, and randomly encounter either Grandma ailing in bed, or a fatally carnivorous wolf. What I found interesting about this scenario is that there's a basket of goodies in the mailbox outside, but for some reason Grandma doesn't want them and instructs us to return them to Little Red Riding Hood. When we do so, Red claims that somebody stole her basket of goodies and gives us a bouquet of flowers for our trouble. Something about this family is either very strange or very confused; one doubts the goodies were stolen by a well-meaning thief and sent to the wrong Grandma. But it's an adventure game, and such conflicts are par for the course. A nice visual touch here is that Little Red's animation changes from a mopey walk to a bouncy skip after we give her the basket. 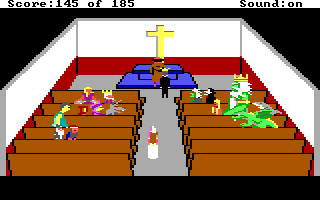 Religion in adventure games is usually treated perfunctorily, deus-ex-vending-machine style, and this one's no different. We get a protective silver cross from the monastery by kneeling and PRAYing next to the monk. The monk also turns up later to perform certain official duties. Oddly, the game has no INVENTORY or TAKE INVENTORY command -- we have to use the Tab key to see Graham's possessions. 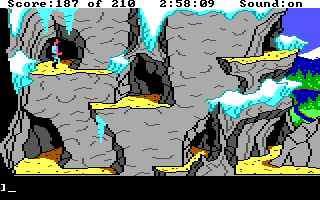 As in King's Quest I, there are hidden treasures in several places -- for example, a diamond brooch concealed within a hole in a rock -- and a randomly wandering dwarf who steals these goodies if he touches us. At least in this game we can visit the dwarf's home when he's (randomly) away, and steal some (presumably second-hand) earrings from his treasure chest. There are numerous ways to die -- we can drown in the poisoned lake, or fall into a chasm, or get taken out by the wolf, or Dracula, or Hagatha the cannibalistic witch, or the wandering enchanter (whose spell ends the game by turning Graham permanently into a frog.) And there are tricky physical challenges again -- climbing up ladders and staircases at odd angles, Graham is prone to fatal falls. Hagatha is very much like the witch in KQ1, but fortunately, she doesn't see as well. We can enter her cave quietly to rescue a nightingale she has kidnapped -- but if we pick it up without covering its cage, it sings, alerting her, and we are treated to a recycled joke about how much she would "love to have you for dinner." Thankfully, Ms. Williams does provide us with some clues this time around. Each of the three magic doors has an inscription hinting at where the key may be found. The first reads, "Whosoever chooses to seek the key for this door will undoubtedly make a splash." Hint hint. We return his trident (assuming we picked it up from the beach) and are given a key and a bottle containing a cloth. Opening the magic door, we are confronted with a second magic door, and a clue indicating that seekers of the second key should "set their sights high." One area where KQ2 improves on KQ1 is that its structure keeps us from trying to solve problems too early. The antique shop is closed initially, opening for business only after we have opened the first magic door. The proprietress has an oil lamp for sale that costs us two treasures OR a successful rescue of her nightingale from Hagatha. I got hung up for a bit after acquiring the lamp, but finally remembered Roberta's general approach -- if we find a lamp, we should perhaps think of the Arabian Nights more than Zork. We have to RUB LAMP, at which point a genie appears and gives us a magic carpet. We can then FLY CARPET to reach a mountain top, where a poisonous viper blocks the way. We can actually rub the lamp three times; the second rub gives us a sword that efficiently dispatches the viper, the third a bridle that I never found a use for. 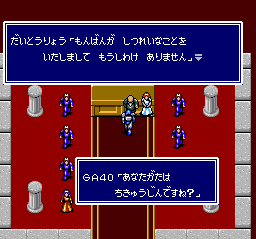 Wandering through the land, we may encounter a random fairy who gives us a temporary protective spell -- just like KQ1's fairy godmother -- but it does seem to last quite a while. 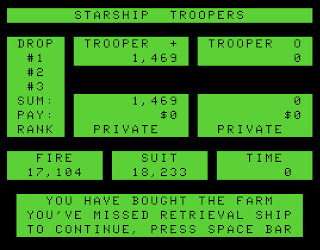 There's also a Scott Adams-style plug for another Sierra product built in -- if Graham happens to look into a hole on the mountaintop past the viper, he gets a fairly substantial non-interactive preview of Space Quest! The inscription on the third door tells us we "must have a stout heart," which is fairly vague, but as we're running out of other areas to explore, implies it's time to see if we can get across the poison lake to the foreboding castle visible in its center. Fortunately, there's now a boatman waiting there who can take us across, if we can beat the parser's unexpected stubbornness -- he's not FIGURE or BOATMAN, but FIEND, apparently. After finding my way to Dracula's coffin, I was prepared to do away with him (though it's not strictly necessary.) But while I thought I had my vampire slayer's kit all set to go, with a mallet and a stake, the game thought differently. 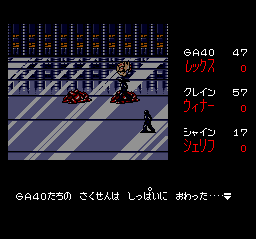 KILL DRACULA WITH STAKE does not work; nor does STAKE DRACULA; nor USE STAKE AND MALLET ON DRACULA. A simple KILL DRACULA does the trick. But we need to be quick about it -- if we don't kill him efficiently, he sees the cross we are wearing, transforms into a bat, and flies away. Killing him lets us find an extra silver key, which opens a chest in one of the castle's towers with a tiara treasure inside. We have to pass through the thorns AGAIN on the way out, but at least we don't have to pay the boatman for the return trip. We have to find a way across the hot pink ocean -- there's a fishing net on the beach, and if we cast it, we catch a golden fish. LOOK FISH once it's been landed on the beach reveals that it's gasping and writhing in agony, and when we kindly toss the poor creature back into the ocean, it says, "In return for saving my life, I wish to offer you a ride across this ocean." Which is much appreciated, and very handy; Graham is apparently of Machiavellian philosophy, or simply feels it would be impolite to mention that it was he who endangered its life in the first place. We find an amulet on the island, which, Roberta Williams-style, has the magic word HOME written on it. Inside the tower, we find more tricky stairs to navigate, encounter a lion at the top, and (in my playthrough, at least) give him some ham found in Dracula's castle to pacify him. 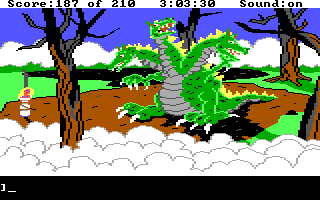 I had played through King's Quest II on my college roommate's computer, back when it was the new game on the block, and enjoyed revisiting it -- it's not notably better than King's Quest I, but nostalgia does have its attractions, and seeing it in proper 16-color EGA was a minor revelation. Sometime soon, we'll take a look at King's Quest III, which finally takes the world of Daventry into new storytelling territory. The LoadDown - 03/15/2010 - Castlevania Rondo of Blood! WiiWare --Two solid efforts this week. Rage of the Gladiator is sort of a medieval fantasy variation on Punch-Out, with support for Wii MotionPlus. Triple Shot Sports is a well-implemented target-shooting game, ported from the iPhone to WiiWare for a reasonable 500 points. Wii Virtual Console -- We get a major, long-awaited title this week -- the Japanese Castlevania: Rondo of Blood (aka Dracula X: Chi no Rondo) for the PC Engine. This game is considered to be one of the finest 2-D Castlevania games Konami ever published, and at 900 Wii points it's a heckuva lot cheaper than the original game. DSiWare -- 4 substantial games this week; the DSi has clearly been attracting developers' attention. Zoo Frenzy is a Tycoon-style game with animal care mini-games and a Pokemon-style collecting element. 101 Minigolf World supplies stylus-controlled miniature golf with 100 3-D holes to play. Battle of Giants: Dinosaurs - Fight for Survival seems to be a fighting/exploration game with customizable dinosaurs. Car Jack Streets is reminiscent of the original top-down Grand Theft Auto. XBox Live Arcade -- Last week saw the release of one new game called Scrap Metal, an old-fashioned top-down multiplayer car combat game that feels like a pre-Playstation take on the Twisted Metal franchise. It's well-implemented, with a victory-based mechanism for acquiring new vehicles, but the arenas are small and the gameplay doesn't feel terribly fresh. PS3 on PSN -- Two games previously seen on other platforms hit the PS3 via PSN last week. Popcap Games' Feeding Frenzy 2: Shipwreck Showdown arrived, along with Capcom's neo-retro Mega Man 10. It's Just As Good As Gameboy! 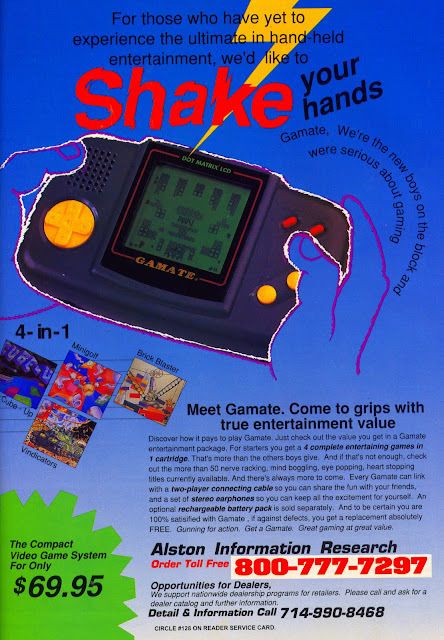 Why buy a Gameboy when you could have a Gamate instead? Well, there are many reasons, actually. Alston Information Research's hyperbolic ad campaign is a tad misleading. There isn't any sort of rumble-pack involved here - the hand-shaking potential of the Gamate is strictly metaphorical. It is billed as the ultimate in hand-held entertainment, employing one of those advertising phrases that sounds like it means something but is in no way objectively verifiable. 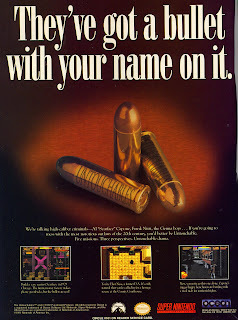 So the Gamate may have made its only appearance on these shores in a handful of magazine ads, despite the dozens of games waiting in the wings. Or because of them, actually. Somehow, I can't help feeling that Witty Apee and Incantational Couple were unlikely to challenge Super Mario Land and Tetris for market dominance. The Last Days of Infocom - Now With Babes! It was the end of an era when Infocom began adding graphics to its text adventures. It's still a smart joke. Kind of. But the ad devotes more space to the attractive alien woman than to the details of the game itself. One can't really blame the publisher, I suppose; business is business, and Mediagenic/Activision had recently acquired Infocom. It was in the shareholders' interests for the new management to milk the company's legacy for all it was worth. But the computer game world was changing, and the original text-only Leather Goddesses of Phobos was already being thought of as a relic of a bygone age. 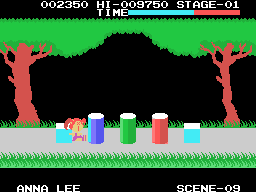 To justify the additional investment in graphics and audio, it was necessary for the game to sell to a wider audience, a cause which somebody decided would be aided by trotting out yon cleavage. Epitaphs in the game industry are so rarely fitting. This time, I am well and truly beat. I find myself defeated, confused, and drowning in a sea of language I am ill-equipped to comprehend. 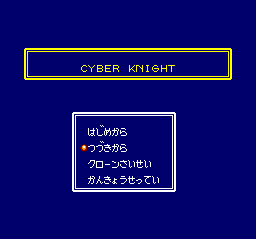 For this is Cyber Knight, a Japanese game that's as opaque as any I've attempted to tackle. The music really is quite pleasant, and if I could understand the story -- or the menus -- I would probably find this to be a fun, competently-executed JRPG. It seems to have some depth, and I like the mixture of mechs with a traditional Final Fantasy-style role-playing experience. But sometimes one really does need to speak the language to get by.